I always take warm clothes just for the plane. 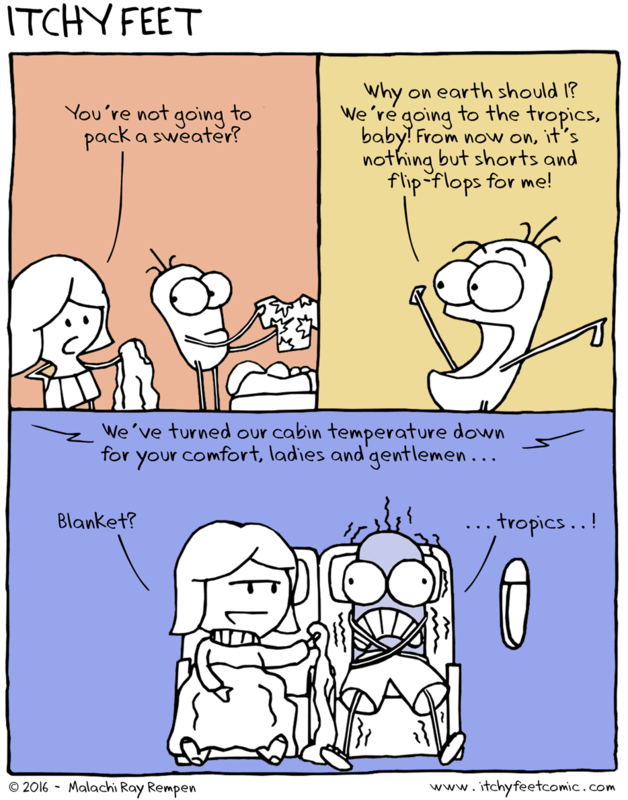 You definitely need a sweater in the tropics --- all indoors, malls, restaurants, offices, are kept ridiculously cold. Crazy right? The inverse is also true - in Berlin for example, in the winter, a lot of cafes and indoor areas are absolutely melting hot. I'm already wearing all these clothes, do I have to take off my coat and scarf AND sweater just to go shopping? Maybe just "chilly" would be fine, I'm already dressed for it! Half of this is just because you are used to chillier temperatures in the winter. In the winter 22 feels warm, near hot, and in the summer 25 can feel quite cool. But I hear of even more insane stories from the country of waste. There it seems to be normal to set the office in the summer to freezing (20C or less) so everyone wears a sweater in the f**** summer! Which is insane in so many points is blows my mind. I used to work in Singapore, where the employer provided all employees a jacket to be worn in the office, since it was so cold. Despite constant complaints, they refused to lower the air-conditioning, since "it was automatically controlled." The same in buses which were dripping water. Has Itchy been on the weights? Now available in 3D, with added muscles. And here I am trying desperately not to show my flop sweat because I'm getting too damned over heated on a plane. Wife will point her air nozzle at me just because I'm burning up.